It’s official. 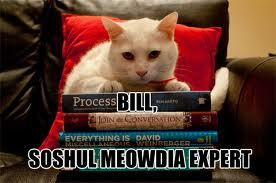 Those feline creatures really do rule the Internet. No matter how much we, dog people, try to deny it, cats have the power. And social media is not exempt! (I know, this was official 10 years ago. I’ve been living like an ostrich with regard to this.) Heck, take a look at cats’ social media profiles (of which there are quite a lot) and you’ll see they have more followers than you and your mom! This time, it’s all about cats. And I suppose these creatures serve as appropriate subjects if you really want your infographic to spread like wildfire via social media. After all, I have known people (who are not exactly cat lovers) to turn to cat photos and such to increase engagement online. Can’t blame them, can you? 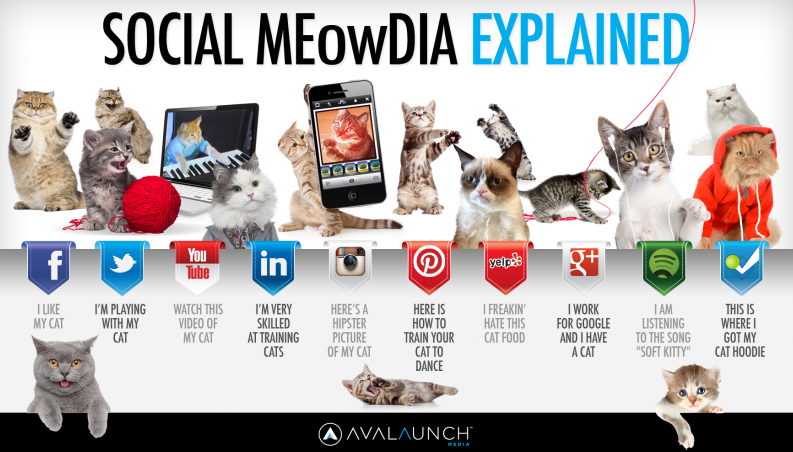 So, Social Meowdia Explained. Ready? Facebook: I like my cat. Twitter: I’m playing with my cat. YouTube: Watch this video of my cat. LinkedIn: I’m very skilled at training cats. Instagram: Here’s hipster picture of my cat. Pinterest: Here’s how to train your cat to dance. Yelp: I freakin’ hate this cat food. Google+: I work for Google and I have a cat. Spotify : I am listening to the song “Soft Kitty”. Foursquare: This is where I got my cat hoodie. That text may make you chuckle, but coupled with images is the best way to go about it. Here, take a look, waste a little time on a Monday, and let me know if your cat says it’s right.